Now I want to go over installing an aftermarket amplifier. This task is one of the scarier ones for someone new to electronics, but hopefully we can make it a lot easier. This guide applies universally for virtually any car, but we'll get into some of the specifications of amplifiers as well to help with the buying decision. To start, what does an amplifier do? It receives power from an external source (in our case the battery) and ramps up the power output of an input signal. It's a system that takes in an input and sends out a higher voltage output. Car audio amplifiers typically include several other features relating to processing, such as filters and phase offsets. These too will be discussed. An amplifier cannot clean up a dirty signal. The amplifier is often one of the main branching points out to the various speakers throughout the car. 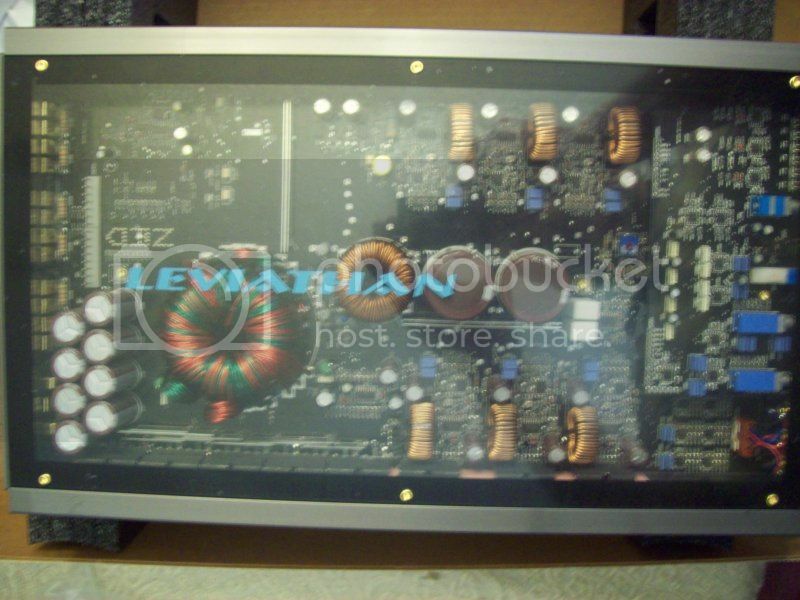 In this picture you can also see passive crossovers between the amplifier and the speakers. This is the most common arrangement. The smaller the number, the larger the wire. Wire has inherent electrical resistance (virtually every physical object does, including the vacuum of space). The longer a wire you need, the higher this resistance gets, the more power it dissipates, and the warmer the wire becomes. For that reason it's important to use the correct size wire for your particular application. You can't go too big on wire, but going too small will create heat and could become a problem. Lamp cord is typically in the 12-14 gauge range. Interior wiring running through your walls is usually somewhere in the 14-18 range. The smallest wire you can find at a home depot or walmart is usually going to be about 22 gauge. When you get into the bigger ranges you hit 0 gauge wire. This is typically about as big as you'll possibly need unless you're building a huge subwoofer system. When you're ready for that, this guide won't be applicable for you anymore. They make larger wire and they start counting it by double 0, triple 0, etc. ("double ought" and "triple ought"). You can see those ratings on the chart above. The most important specification in terms of electrical properties of wire is the cross sectional surface area of the conductive surface, followed by the conductivity (the inverse of resistivity). Copper is one of the more common conductive metals used. Silver is the best natural metal conductor. Gold is sometimes used to prevent oxidation (thanks for the correction db_ohno). Aluminum is a suitable substitute for copper too. You generally want to avoid soldering different metal types as the bond will break down over time. Aluminum wire was a big culprit for this in homes built in the 50s, 60s, and 70s. More insulation is better, but any wire specified for audio use should be sufficient for power and ground wire. I've used lamp cord for subwoofers before and I'd dare anyone to tell me they could tell. Don't blow a bunch of money on a brand name for power, ground, or speaker wire. Wire is one of the biggest snake oil industries out there. Another word of caution. If you run 4 gauge power wire you MUST use 4 gauge or larger ground wire. Always keep your ground wire the same or larger than the power wire, and preferably keep it shorter than the power wire. If you don't you'll have a hot running amp that may go into protect mode. That's not good for it. If your amp doesn't have any built in protective circuitry you could even fry it, start a fire, or leave a burn mark wherever you mount it. The problem comes from power going in, without anywhere to go out. This is a simplification. It leaves the power supply with no other place to get rid of the excess power draw than to dissipate it through the resistors as heat, and your smallest wire dictates your maximum amperage draw. Basically, you'll be maxing out your ground wire. So that covers power and ground, but what about the REM wire? REM is an abbreviation for remote turn-on. This is the wire that tells the amplifier that you've started the car and would like to use your sound system. Typically you'll want to run this to your head unit's remote turn-on wire, which is usually blue or blue/white striped. Alternatively, you could wire this into the ACC wire of your ignition to achieve similar results, but why would you when your head unit has one? This wire can be much smaller. It carries very little power, and the "quality" is virtually insignificant as it never has anything to do with the audio output. This is the business end of the amplifier. It's usually referred to as the output or output channels of the amp. 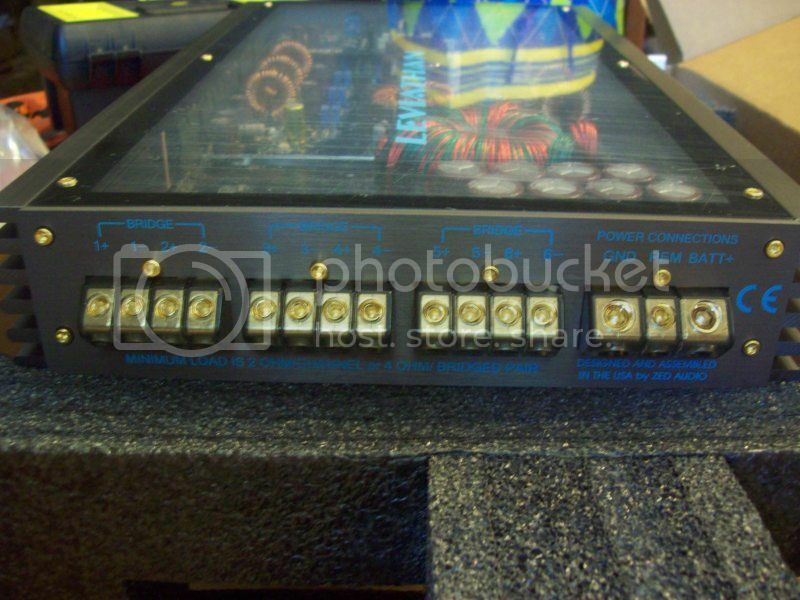 Because this is a 6 channel amplifier we've got a total of 12 output terminals (power and ground for each channel). Your speaker wires go here. P is power (watts), I is current (amps), V is voltage (volts), and R is resistance (ohms). Resistance is a DC property. When dealing with AC voltage we call this impedance, which just means we tack on a phase angle to the DC resistance. I won't jump into the math here, but if anyone's interested in understanding the underlying math behind impedance I'll be happy to discuss it further. It involves complex numbers with a real part and an imaginary part, and the unit circle you may or may not remember from high school algebra, trigonometry, or geometry. Electrical Engineers use C for capacitance, so current get's to use I. There's really no good reason for I but it wasn't being used. When they picked I for current they didn't understand AC voltage, so impedance gets the letter Z. Anyone with a basic calculator can do these calculations. These are the signal inputs from your head unit or processor. The slang for them is RCAs because RCA was the company that invented them back before anyone reading this was born most likely. As technology goes, these guys have really stayed relevant. 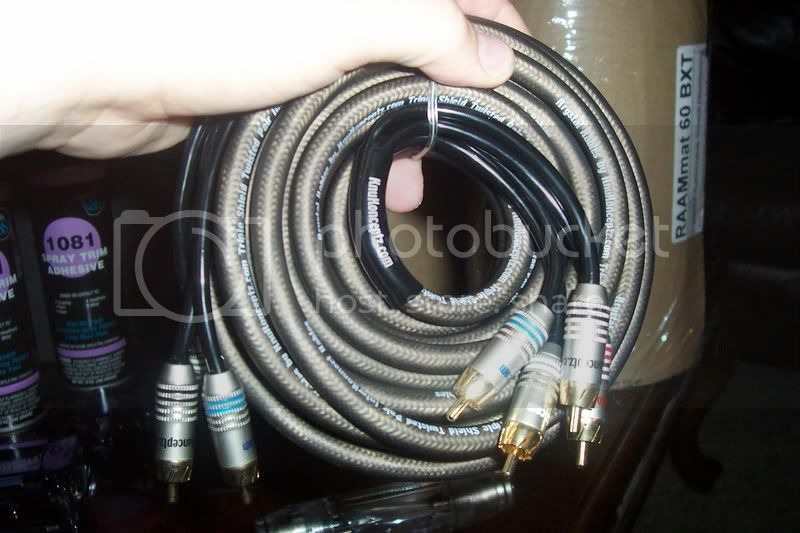 These are the same cable type that many people use for their TVs today. When we went to HD TV we added 2 more to the standard 3 red, yellow, and white. HDMI might finally knock them off their pedestal, but that's another conversation. There are other forms of signal wire, but virtually every amp made today has RCAs as an option. An important thing to know about these is that they have a built in power and ground. The outer portion of the plug is the ground, while the inner stick part is the power. It's very convenient. Therefore, instead of running 12 different wires, we only need to run 6 (or 3 pairs). We often refer to them as pairs because most audio is recorded in stereo, so for every right we're going to have a left too. This isn't necessary though, so it's better to think of them as individual channels, especially as you get into more advanced systems, or systems with a center channel (the typical 5.1 surround sound). After all, when one speaker isn't working, it's not the pair that you need to troubleshoot. The quality of RCAs is a little more important than power or ground wires. You want these to be well shielded. You don't have to spend a fortune on RCAs. Generally speaking, I wouldn't spend more than about $2 per foot of length. I personally have always had great luck with www.knukonceptz.com for all wire related products. All my RCAs come from there, and most of my power, ground, and speaker wires do too. These need to come from the head unit located in the dash. Sometimes you might have something extra in between, but the source of the signal is the source of the signal. Some folks like to keep the oem head unit intact. In their case, they'll need a Line Output Converter. It takes a speaker wire signal and converts it into an RCA. This isn't the cleanest method, but it's a useful one when the factory deck is desired. Some amplifiers will accept a signal on a speaker wire (called high level inputs). The amplifier pictured above will not. 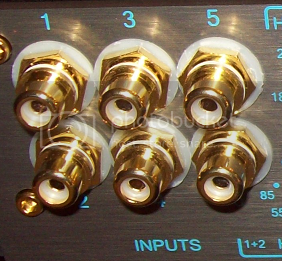 This is typically not seen on higher end amplifiers, and it's being phased out of lower end ones. On the left you can see the words "high pass". To the right of that, you might not be able to see it as well, but it says "low pass". I'm going to ignore the push buttons in the middle there as that is specific to this particular amplifier and not as common. On the right you can see the gain dial/knob. I say loose because there is no standardized definition for these. Filters make sure these frequencies go where they're supposed to go. A high pass filter sends out only high frequencies. A low pass filters only lows. A bandpass filter is a combination of a high and a low pass, where the low pass allows things below say 3000 Hz and the high pass allows things above say 500 Hz. This effectively gives us a passband of 500-3000 Hz, which is a good range for a 3 or 4" midrange speaker. Filters are very important for speakers. If you try to play subbass through a tweeter, you will destroy your tweeter, or at the very least it will sound horrible until you destroy it. This is a good time to talk about the difference between active and passive crossovers. A crossover is nothing more than another name for a filter. Filter is the function while crossover is the object doing the filtering. Low pass crossover would be understood just as well as low pass filter. An active crossover simply means you are performing your filtering BEFORE amplification, while a passive crossover performs filtering after the signal has been amplified. This seems like a silly distinction, but the reason this is important is that filtering dissipates power. If you amplify a signal up to 100 watts, but then you have to cut off all the low notes, you lose maybe 80% of your wattage as heat through the filtering. The speaker only sees 20 watts (for instance). Passive crossovers also typically don't allow much if any adjustment. They are discrete components (a combination of resistors, inductors, and capacitors) with fixed values. They'll always high pass at a fixed value, like 3000 Hz, with no option to change it to 2500 Hz if you want your tweeter to play a little lower. Active systems allow much greater flexibility because they are typically adjustable either via an adjustable capacitor or resistor tied to a knob. Plus you don't have to waste all that amplifier power as heat. The drawback is that they can be expensive and for a beginner they can be complicated. I'd be happy to discuss these further if anyone is interested in the differences between active and passive crossovers. In the case of this 6 channel amp, I could run a 3 way active frontstage (tweeter, midrange, midbass) and actively cross each component. For most systems out of the box, they'll come with a passive crossover, so you could run a 2 or 3 way frontstage passively off of just 2 channels. 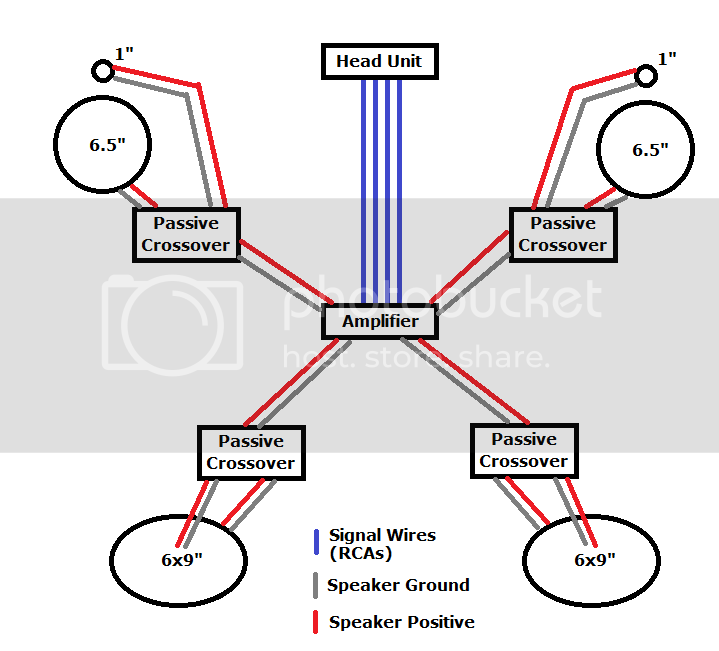 The passive crossover would receive the fullrange signal and then split it into 3 clones of itself, then filter each of these 3 clones before sending it along to the individual tweeter, midrange, and midbass. So you only need 2 channels of amplification, but you lose the ability to adjust the component speaker system and lose more amplified power. Lastly for this picture, the gain knob. Technically speaking this is the electrical equivalent of a volume knob, but in practice should not be treated as such. Gain is the sort of adjustment you should make once, then leave alone. 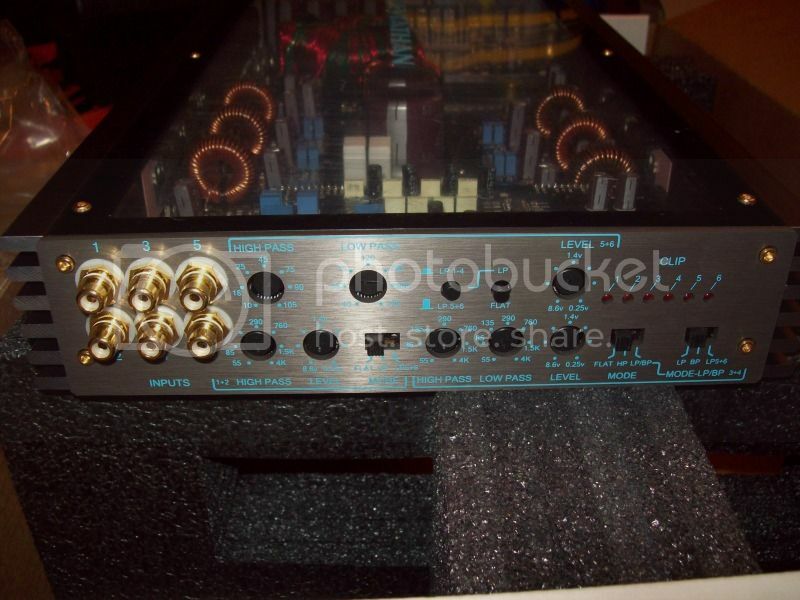 Gain is the most important adjustment you can make with an amplifier and the most abused. You can see in the picture that this gain knob has 3 labels around the circle, 8.6V, 1.4V, and .25V. It looks like the gain is going down, but this isn't correctly. This adjustment is for you to match your head unit's preamp output voltage (the voltage of the RCAs). If you don't match it (or get pretty close) you will cause your amplifier to clip. Typical head unit output voltages are 2V, 4V, and 5V, with some rare ones as high as 8V. Generally speaking, the higher the voltage of the preamp output, the better. The reason for this easy enough to understand. Electrical noise in a car is going to have a set finite voltage. For illustrative purposes, let's say we've got a noise of 1V. This is extremely noisy, but 1 is an easy number to do math with. If we're running 2V preamp outputs from our head unit, then 1V is half that. Your signal has noise that accounts for roughly half of it. Instead, lets do the same thing with 5V preamp outputs. 1/5 = 20%. 20% is better than 50%. This is a highly simplified version of the truth about noise, but the idea is the relative change. Noise is finite, so a higher preamp voltage means the noise accounts for less of the signal that reaches the amp. The sinusoid rises, but then it hit's the ceiling. Suddenly, instead of a clean sinusoid, it goes into a square wave. When this square wave comes out of the speaker it sounds bad to our ear. We call it distortion. If we slowed it way down, we actually wouldn't hear the square wave because the speaker would just be sitting in the "up" position without moving, but the sine wave falls back down really fast (frequency is 1/T where T is the time in seconds for 1 repetition). Even 20 Hz is repeating itself every 50 milliseconds (0.05 seconds). What it comes out sounding like is a fart. It also means that the amp is putting out maximum power for the whole time the signal is clipped. This causes it to heat up and eventually go into protect mode when it's temp gets too hot. Clipping is bad. This is why setting your gain correctly is so important. There are several methods of doing this (voltmeter, oscilloscope, by ear). I'd be happy to discuss any of them. I just finally got around to buying an oscilloscope for home use about a month ago. So that covers the basics of car audio amplifiers. Now I'll say a little bit about specifications that are or are not that important in making a buying decision. Obviously, one of the most interesting figures of merit is it's output wattage. The crucial spec to look at here is RMS power (root mean squared power). This is synonymous with "continuous" or "nominal" power. Peak output is a throw away number. We don't care about it for music, but flea market brands like to advertise it. In fact, a good way to weed out the cheapo brands is to see if they advertise their peak output numbers on the marketing material. The bigger and bolder the font, the less likely that the product is something you'll be satisfied with. RMS power is only half the rating though. We need to know the RMS power at some given impedance. As we saw further up, ohm's law comes into play here. You have no power without some sort of resistance/impedance. Halving the resistance doubles the power until the amp's power supply can't handle the smaller and smaller impedance and becomes unstable. In truth, output power is an overhyped number anyway. In terms of audible difference, you have to double the output power to hear a slight increase in volume from the human perception. So 100 watts RMS @ 4 ohms is basically the same thing as 125 watts RMS @ 4 ohms. Frequency Response should be as flat as possible. This isn't usually a big deal, but can be on lower level amps. The problem is, lower level amps don't go advertising that they don't have a flat frequency response. Input voltage range refers to the preamp output of your head unit. Again, typical head units are 2V, 4V, 5V, and rarely 8V. This shouldn't be a major concern, unless the amp you're looking to buy can't handle your head unit's voltage. Slew Rate is an interesting spec, but hard to find for even mid-level amps. It tells us how fast the amp can change from one voltage level to another. It's directly related to the frequency response. An important spec for some will be the built in filtering functions, especially if you'd like to run an active system via on-amp filtering. Another potentially very important thing to know about an amp is it's class. Today there are 4 main classes of amp being made. Class A, Class B, Class A/B, and Class D. I'm not going to get into the specifics of each, and these aren't the only classes of amplifier out there. They're just the ones you'll be able to buy today. A/B is most common for full range amps, while class D is becoming more and more popular for subwoofer and even full range amps. Class D are more difficult to design and until recently got noisy in the upper part of the audio spectrum due to the design of their power supply. Some of the more cutting edge designers have started tackling this problem to get a more linear frequency response to take advantage of class D's efficiency. Loosely speaking Class D tend to be 75-90% efficient in converting electrical power to the amplified signal. Class A is the least efficient in the range of 20-40%. Class B got more efficient between about 50-70%. A/B is basically a class B that shares a few design ideas from class A to keep it's response linear. They sacrifice a little bit of the pure class B efficiency resulting in typical efficiency of somewhere between 50 and 60%. Class D are now getting up to 90% efficient at converting power taken in from the battery to amplified signal power out. This means they run very cool compared to A, B, or A/B, and your alternator will thank you. A few other key features to look for. A subsonic filter is a high pass filter for subwoofers to make sure they don't overextend themselves. It's very useful for a ported or bandpass subwoofer box system. RCA pass-through is a nice feature to have if you intend to use multiple amplifiers. It peels off copies of the RCA inputs, but also sends out an untouched copy to be sent to another amplifier. The amplifier being looked at above does not have an RCA pass-through. 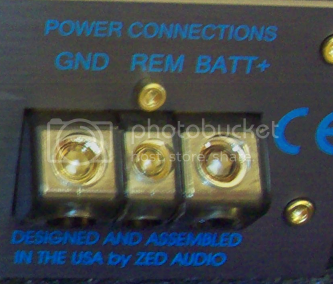 Of course you'll want to make sure the physical dimensions of the amp will meet your criteria. Some amplifiers build massive heat sinks to get rid of heat, but it ends up making them so big you can't put them anywhere. This is sometimes called the amp's footprint (length, width, and height). That's about all I've got to say about that. Feel free to ask questions and I'll be happy to share anything I can. Last edited by ceri; 10-29-2012 at 09:41 PM. Good write up, but remember this isn't a car audio forum. It would be a lot more helpful for the average joe on here on how to install an amplifier in our cars. I.E. how to remove panels, running wire (cleanly lol), where to ground, where to power, ect. I know. It's a basic guide to amps in general. I figure it's a good place to start a conversation. Without a doubt, if you get to editing it, a proper list of tools would help too, so no one breaks stuff. Yay! Someone read it! Thanks for the correction. I've edited it above. Aren't the tools all going to be specific to the amp? A lot of amps use allen keys. Some use phillips head. Since it's not very specific to the challenger, I don't know if I can get too specific with the required tools. I mean if you did a guide for installing the amp, like removing panels and installing. 1/8th " bit, wire brush drill bit, panel poppers, ect. I think he is referring to tools needed to complete the job. Things I would make sure I have in my tote are: plastic trim panel tools for dash removal, drill with Phillips and 7mm socket attachment for radio removal, wire strippers, a multi-meter, soldering iron and tape (I prefer more layers of protection than heat shrink offers), panel tool for removing sill plates, ring terminals for ground/battery connections, Allen keys for amplifier connections, and wire brush attachment for drill to make a good ground connection. Depending on your skill level you may also include an oscilloscope, or amplified speaker and test cd with reference levels, for setting gains----this is far more advanced for the shade tree installer though.